I am delighted that our community garden idea at the Abbey Neighbourhood Centre was launched this week. The idea of the project is to link with the very popular youth group which takes place on a Tuesday night, attended by approximately 60 kids and get them involved in growing and caring for their own plants and vegetables. 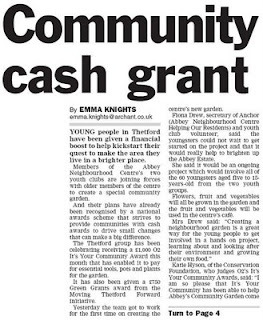 ANCHOR (Abbey Neighbourhood Centre Helping Our Residents) obtained funding from O2 (£1,000) and Keystone / Breckland Green Grants (£750) and on Tuesday the project was launched with a cheque presentation from O2. Full credit to the fantastic Youth Club team for all their efforts as usual. Fingers crossed for some more good news in the near future. And it made front page of this weeks Thetford and Brandon too! !